A mesh for climbing plants wraps the angular balconies of this apartment block in Alpine Switzerland, completed by Buchner Bründler Architekten. The Basel-based studio won a competition to contribute to a new housing complex in Wabern, which called for buildings that create a dialogue with the outside. The Garden Tower is designed to resemble a natural formation, breaking away from standard housing typologies, and encourage residents to live close to nature. 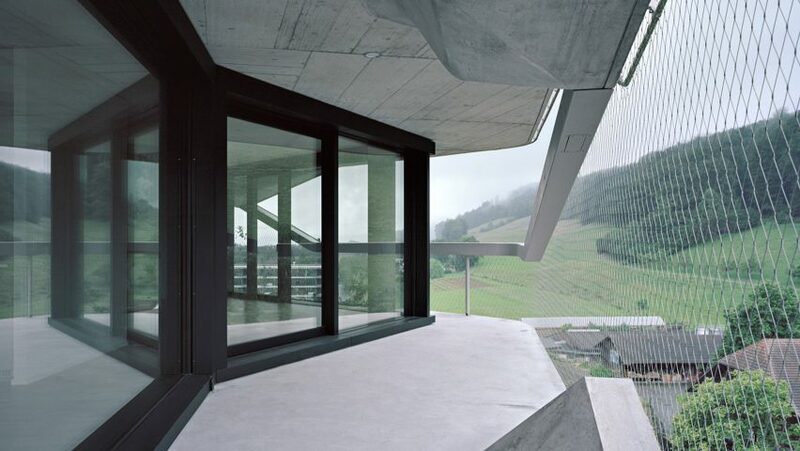 Its floor plan is a distorted hexagon, giving it an unusual internal layout, while its entire exterior is surrounded by asymmetric balconies, reminiscent of the surrounding mountain ranges. "This area was subdivided into five fields in a masterplan by AGPS Architecture from Zürich," Buchner Bründler Architekten told Dezeen. "Each of these zones had its own theme – ours was living with a view." "Since Wabern itself has a diverse range of housing, the idea was not to create a homogeneous housing typology but allow a heterogeneity to coexist." To reduce the visual impact of the 16-storey tower, it is wrapped by a rhomboid-patterned metal mesh, facilitating the growth of climber plants that delicately decorate the building. The vertical garden, which inspired the name of the scheme, also provides natural shading for the floor-to-ceiling windows of the apartments contained within. The result is an uneven, jagged structure that bridges the gap between building and nature, according to the architects. "We were interested in working with the amorphous shape in the natural surroundings," said the architects. "The shape is polygonal, because we wanted it to open on all sides towards the landscape and this shape allowed us to make the horizontal floors less visible," they continued. "Like this, the building with its vertical gardens looks more natural, more like a green rock face." The concrete floor slabs project beyond the building's walls to create the balconies. They are punctuated by flower beds and finished with curving metal balustrades, which mimic the undulating landscape. Each floor has between one and three apartments, with layouts determined by their orientation. There are also storage spaces in the basement. All of the apartments are open-plan. They are arranged around central core zones containing bathrooms, ensuring that views of the surrounding landscape remain uninterrupted. The polished concrete finish of each balcony continues inside the apartments for the floors, walls and ceilings. The aim was to create a connection between inside and out. Buchner Bründler Architekten is led by architects Daniel Buchner and Andres Bründler. Other firms working on similar projects in the area include Buzzi Studio Di Architettura, which recently completed Residenza Le Stelle – a housing complex orientated to provide residents with views of the surrounding mountains.